Chandigarh Pollution Control Committee's member secretary P J S Dadwal said this is the first time that Chandigarh has pollution of such levels. CHANDIGARH: The effects of stubble burning in Punjab and Haryana have now spread to the Union Territory of Chandigarh. Pollution levels in Le Corbusier’s city soared 341 per cent higher than the annual average, leaving the air quality index in the Very Poor zone. The Chandigarh Pollution Control Committee (CPCC) has urged the health department to issue an advisory to citizens. As per CPCC figures, pollution in the last three days has been 25 per cent higher -- 306 to 362 micrograms per cubic metre -- than on Diwali, October 19. The annual average is 82. The pollution watchdog’s member secretary P J S Dadwal said this is the first time that Chandigarh has pollution of such levels. It can only be due to stubble burning in Punjab and Haryana, he said. Trains and flights have been running late for hours due to the smog. Hospitals have reported a 50 per cent rise in the number of patients with pulmonary aggravation compared to last week. Met director Surinder Paul said the particulate spike in the air is due to winds blowing in from the southeast and a high-pressure area emerging from the northwest. Due to the cold conditions, smoke particles get locked, leading to hazy weather. 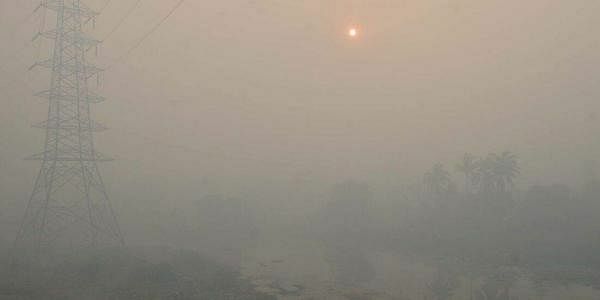 However, rainfall is expected in the coming days and pollution levels are likely to drop.